Discussion in 'Build Showcases' started by IceColdSprite, Apr 1, 2019. On August 13th, 2017, "Downtown," the original map of La Palma, was reset due to a glitch in World Edit. Although there wasn't much progress back then, the reset devastated me. Ever since that day, I have made rebuilding that world into a passion project. Now, on April 1st, 2019, one and a half years later since, Downtown La Palma is now complete for now at least. Downtown La Palma is influenced by the city of Los Angeles. Originally a plan for a city on a survival multiplayer world, Downtown La Palma since then grown into a sprawling metropolis, with many districts divided in the city area. From the financial center of Downtown West to the bustling clothes and retail shops of the Fashion District, there are many diverse neighborhoods in Downtown La Palma. Bounded by Constantine St on the North, Empire Ave on the East, Summit Blvd on the South, and the El Capitan Fwy on the West, Downtown West is the financial hub of La Palma. Many of the skyscrapers in the district are leased towards architecture companies, law firms, real estate companies, and banks. Directly south of Downtown West, Cochley Park is a booming neighborhood in the downtown due to its transit-friendliness and closeness to major business and shopping centers. The majority of all new skyscraper and apartment developments are located in the neighborhood. It is bounded by Summit on the north, Broadway on the east, the Santa Mika Fwy on the south, and the El Capitan Fwy on the West. The Historic Core District is the largest district in Downtown. Home to many historic buildings, the district once served as the old financial and commercial center of La Palma during the early 20th century, with Main Street being compared as the "Wall Street of the West." After World War 2, however, many of the buildings fell into disrepair due to office jobs moving to newer modern buildings like in Downtown West. Today, some buildings are under renovation to become lofts for those who wish for "Urban life experience." The district is marked by Justinian St on the north, La Palma and Main St on the east, Olympus Blvd and Sentous St on the south, and Empire Av on the west. This small strip on Broadway stretching south as Sentous St and north to Justinian St serves as a historic overlay for many theaters built during the early 20th century. While most of the theaters are still intact and can still serve as theaters, others have been converted into other commercial uses. The area in which the park was located was at first a public grazing space for cattle in the early 1870s. In 1880, under the land developer Wilfred Ahpington, the grazing space was converted into a small green park similar to Central Park in New York, with it bearing the same name. The park's name was changed to Remembrance Park after the 10-year anniversary of the Great La Palma Earthquake of 1890, with a golden statue built to commemorate those who died during the quake. Since then, the park has seen many renovations, with the most recent one done in the 1990s, with much dismay. Plans of changing the park in the future continue to this day. The park bounded by Constantine St on the north, Broadway on the east, Augustine St on the south, and Monte St on the west. The fashion district is the heart of fashion wholesale in Downtown La Palma. Many of the buildings consist of wholesale shopping, textile, and manufacturing stores. The most notable attraction in the district is the Sentous Alley. The Fashion District is bounded by Olympus Blvd on the north, San Pablo St on the east, the Santa Mika Fwy on the south, and Main St on the west. Consisting of low rises and cheap hotels, Downtown East is the most impoverished area in Downtown La Palma. Homelessness rates are highest compared to anywhere in the city and continue to rise every year. Downtown East is bounded by Constantine St on the north, El Centro St on the east, Summit Blvd on the south, and La Palma St on the west. Although this is the end for La Palma for now, I'm planning on expanding it further after a hiatus! Ice Bear is glad to see it done. Ice Bear remembers seeing the progress of the city. Ice Bear is proud. Yayyy! I liked seeing progress on this, grats on finishing it!! After all the times I came to see the progress... Glad to see that your city is finally complete! By far the most role play and detailed I've seen on Mcbuild, and the historical infos you invented about it were fun to read. 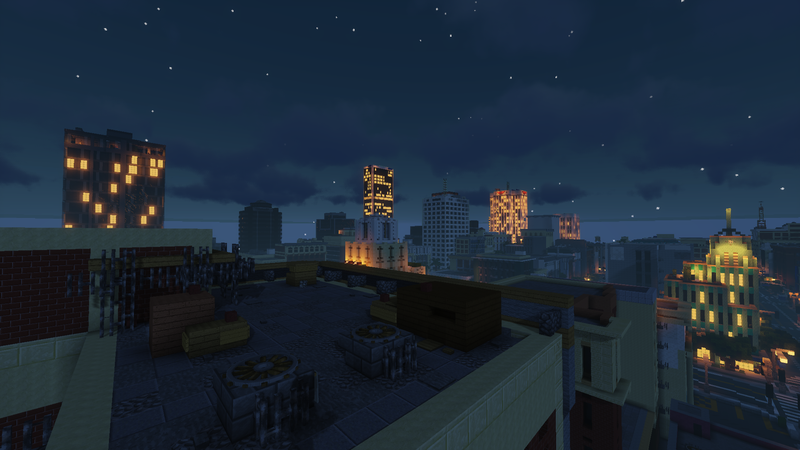 I'd love to see this on Planetminecraft, with an insane render of the skyline of the city!